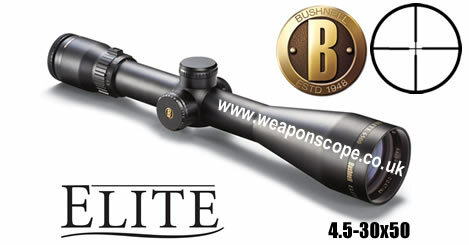 The Elite 6500 Series contains the world's most versatile riflescope, featuring a 6.5x magnification range, the widest in the industry. 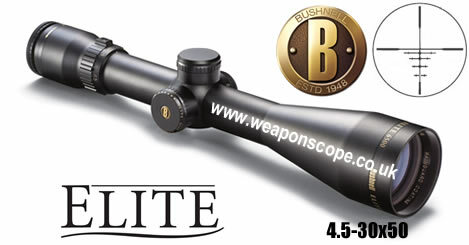 These scopes are ideal for hunters who want a scope they can use in the brush as well as on the wide-open prairie, from Georgia pine forests to the high peaks of the Rockies. Push/pull turrets with resettable zero make sighting-in easier than ever. The extended 80-MOA of windage and elevation adjustment travel (with .25-MOA clicks) make this scope a "must have" for the hunter who shoots a broad range of game and at distances that vary greatly. All models have a one-piecee 30 mm tube to deliver plenty of light for those perfect shots right before legal shooting ends, and up to five inches of eye relief. An ultrafine Multi-X reticle accommodates any shooter. These new 6500 models are flagship scopes of Bushnell's Elite line, with the highest resolution and widest field of view, as well as fully multicoated optics with Rainguard®, ensuring a consistently sharp, clear view even in the worst conditions. Rainguard®  Fully multi-coated optics  Magnum recoil-proof construction  One-piece hammer-forged tube  30mm tube  100% waterproof /fogproof/ shockproof construction  Dry-nitrogen filled  1/4 M.O.A. or finer fingertip, audible/resettable windage and elevation adjustment  Elite® Bullet-Proof Warranty. Make a high-performance tactical decision.As the #1 riflescope innovators in the world, weve worked diligently with law-enforcement and military experts nationwide to design, test and prove the finest family of tactical shooting instruments in the industry. Each model in this line uses the basic precepts of every riflescope we build  unfailing reliability and optical precision  and takes them a step further with application-specific features such as tactical turrets for rapid adjustment, and a blacked-out finish for optimum concealment. 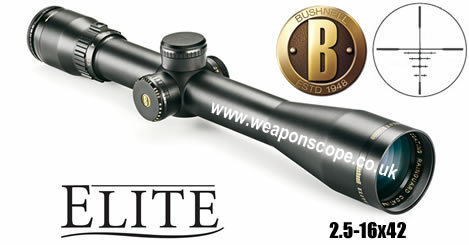 Our top-of-the-line offerings being the new Elite® 6500-inspired options with a 6.5x magnification range. When the stakes are at their highest, whatever your tactical need, trust your shot to Bushnell. Rainguard®  Fully multi-coated optics  Magnum recoil-proof construction  One-piece hammer-forged tube  30mm tube  3" sunshade  Side Focus - 10 yrds to Inf  100% waterproof /fogproof/ shockproof construction  Dry-nitrogen filled  1/4 M.O.A. or finer fingertip, audible/resettable windage and elevation adjustment  Elite® Bullet-Proof Warranty. Rainguard®  Fully multi-coated optics  Magnum recoil-proof construction  One-piece hammer-forged tube  30mm tube  3" sunshade  Side Focus - 10 yrds to Inf  100% waterproof/fogproof/  shockproof construction  Dry-nitrogen filled  1/4 M.O.A. or finer fingertip, audible/resettable windage and elevation adjustment  Elite® Bullet-Proof Warranty. Rainguard®  Fully multi-coated optics  Magnum recoil-proof construction  One-piece hammer-forged tube  30mm tube  5" sun shade  Side Focus - 10 yrds to Inf  100% waterproof/fogproof/  shockproof construction  Dry-nitrogen filled  1/4 M.O.A. or finer fingertip, audible/resettable windage and elevation adjustment  Elite® Bullet-Proof Warranty. Make a high-performance tactical decision. As the #1 riflescope innovators in the world, weve worked diligently with law-enforcement and military experts nationwide to design, test and prove the finest family of tactical shooting instruments in the industry. Each model in this line uses the basic precepts of every riflescope we build  unfailing reliability and optical precision  and takes them a step further with application-specific features such as tactical turrets for rapid adjustment, and a blacked-out finish for optimum concealment. 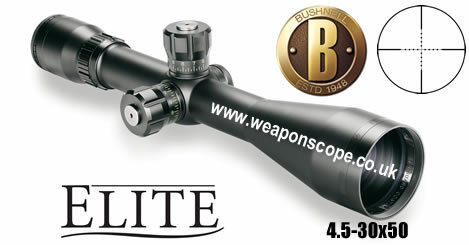 Our top-of-the-line offerings being the new Elite® 6500-inspired options with a 6.5x magnification range. When the stakes are at their highest, whatever your tactical need, trust your shot to Bushnell. Rainguard®  Fully multi-coated optics  Magnum recoil-proof construction  One-piece hammer-forged tube  30mm tube  5" sun shade  Side Focus - 25 yds to Inf  100% waterproof/fogproof/  shockproof construction  Dry-nitrogen filled  1/4 M.O.A. or finer fingertip, audible/resettable windage and elevation adjustment  Elite® Bullet-Proof Warranty. The Elite 6500 Series contains the world's most versatile riflescope, featuring a 6.5x magnification range, the widest in the industry. 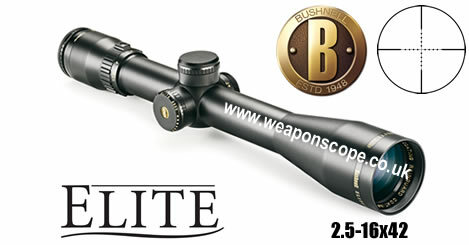 These scopes are ideal for hunters who want a scope they can use in the brush as well as on the wide-open prairie, from Georgia pine forests to the high peaks of the Rockies. Push/pull turrets with resettable zero make sighting-in easier than ever. All models have a one-piecee 30 mm tube to deliver plenty of light for those perfect shots right before legal shooting ends, and up to five inches of eye relief. An ultrafine Multi-X reticle accommodates any shooter. These new 6500 models are flagship scopes of Bushnell's Elite line, with the highest resolution and widest field of view, as well as fully multicoated optics with Rainguard®, ensuring a consistently sharp, clear view even in the worst conditions. 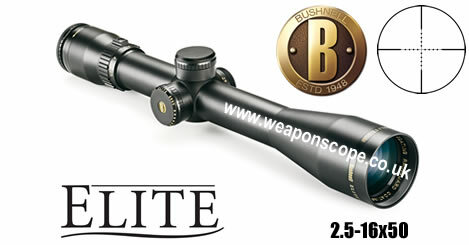 The Elite 6500 Series contains the world's most versatile riflescope, featuring a 6.5x magnification range, the widest in the industry. 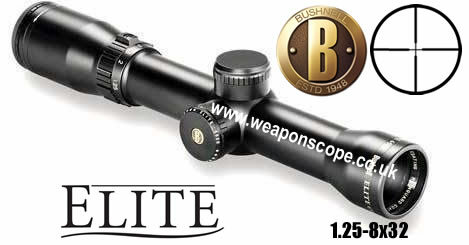 These scopes are ideal for hunters who want a scope they can use in the brush as well as on the wide-open prairie, from Georgia pine forests to the high peaks of the Rockies. Push/pull turrets with resettable zero make sighting-in easier than ever. 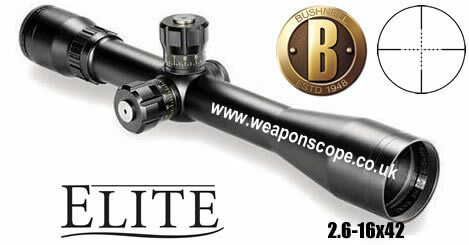 The extended 80-MOA of windage and elevation adjustment travel (with .25-MOA clicks) make this scope a "must have" for the hunter who shoots a broad range of game and at distances that vary greatly. 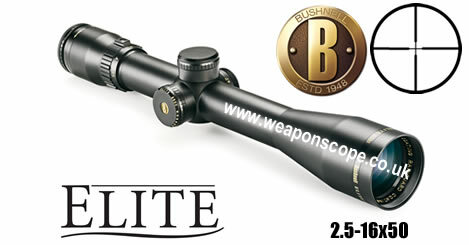 All models have a one-piecee 30 mm tube to deliver plenty of light for those perfect shots right before legal shooting ends, and up to five inches of eye relief.These new 6500 models are flagship scopes of Bushnell's Elite line, with the highest resolution and widest field of view, as well as fully multicoated optics with Rainguard®, ensuring a consistently sharp, clear view even in the worst conditions. Rainguard®  Fully multi-coated optics  Magnum recoil-proof construction  One-piece hammer-forged tube  30mm tube  5" sun shade  Side Focus - 10 yds to Inf  100% waterproof/fogproof/  shockproof construction  Dry-nitrogen filled  1/4 M.O.A. or finer fingertip, audible/resettable windage and elevation adjustment  Elite® Bullet-Proof Warranty.